In the listening exercise, a native Chinese speaker reads numbers randomly within a pre-defined range configurable by you. Your task is to enter the numerical equivalent in the entry field. After you touch “Go”, the application will tell you whether your entry is correct or incorrect. 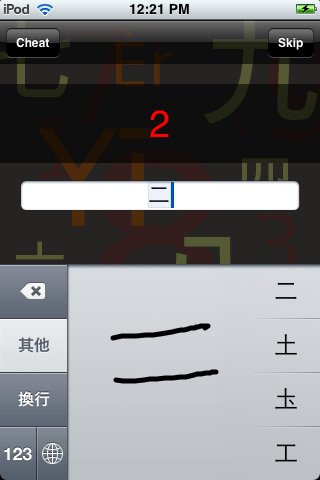 When you type, the system shows the equivalent Simplified Chinese characters for the number in the entry field. You can use this tool to help you learn characters for the Reading and Writing exercises. From 0-100, the numbers you hear are recorded as one unit. Beyond 100, most numbers are assembled from several smaller recordings. This means that the pace may not exactly match a native speaker, and there may be some incorrect tones used with “Yī” since the tone changes under certain circumstances. If you want to change the range of numbers, touch anywhere outside the entry field to see the Min and Max fields behind the keyboard. Change them as needed and use the Skip button to move to a number within the range. If you weren’t able to hear a number on the first reading, use the Replay button. If you can’t figure out a number, use the Cheat button to see the answer. Is there anyone out there who thinks learning Chinese characters is easy? I certainly don’t, and until writing this application, I could read only a handful of characters. Even before the first release, the amount of testing I have done has made reading numbers nearly automatic. I can look at the screen-shot shown here and see “78” without having to think of the English. Like the Listening interface, you simply tap outside the entry field to access the practice range. Use the Cheat button to see the answer. Use the Skip button to move to the next number without providing an answer. It’s long since been obvious to me that the way I learn a foreign language best is by writing it. For some reason, writing seems to lock words into my memory much better than any other kind of practice. The iPhone offers you two ways to write numbers. You can either draw characters as shown in this screen-shot, or you can type using the Pinyin keyboard. The above link will show you where the keyboards can be found in Settings and how to use them with examples provided for DianHua Dictionary. 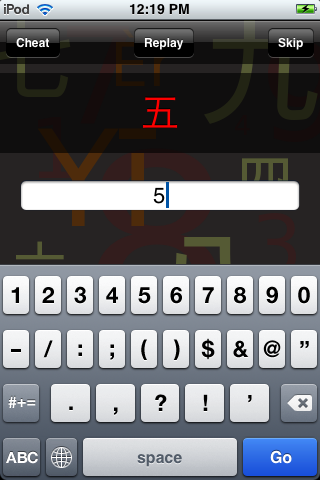 Get DianHua Chinese Number Practice on the App Store.